As 2017 draws to a close, we’re reflecting on the evolution of StrongLoop and LoopBack in the past twelve months. It’s been a big year for our open-source Node.js framework. It started with the introduction of the LoopBack CLI and ended with the LoopBack 4 developer preview release and a request for feedback on a new LoopBack logo - and there was a lot of activity in between! 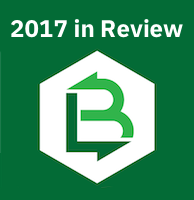 We invite you to join us as we take a look at how things progressed for LoopBack in 2017. There’s a lot to take in, so we invite you to top up your beverage of choice before you begin! In the early days of StrongLoop, the team released slc to build and manage Node applications. Since joining IBM, the StrongLoop team integrated LoopBack’s API creation tooling with IBM’s existing API management options. With the two combined, LoopBack was given its own CLI in January. January also saw the release of a new open-source LoopBack module called strong-soap to go along with the LoopBack 3.0 release. Created by Rashmi Hunt, the module provides a comprehensive SOAP client for invoking web services as well as a mock-up SOAP server capability to create and test your web service. Even as the StrongLoop team focused on the next version of LoopBack, improvements for the existing version of LoopBack still emerged in spring and summer. Tetsuo Seto let everyone know about LoopBack’s new Cassandra Connector in April, delivering on requests from the LoopBack community. He followed up with an explanation of how to use corresponding source code blocks to help make your LoopBack app interact with Cassandra Materialized Views. In May Rashmi Hunt introduced a new LoopBack feature: the ability to generate remote methods and REST APIs for SOAP web services. As Rashmi described, this allows creation of REST APIs that invoke web services easily, even if you haven’t mastered the web service. Also in May, Loay Gewily and Janny Hou shared details about refactoring LoopBack SQL Connectors and the changes to Model Discovery and Migration. Nagarjuna Surabathina demonstrated creating a multi-tenant Connector Microservice using LoopBack. Nagarjuna joined forces with Subramanian Krishnan to write about using OpenWhisk for LoopBack As A Service and LoopBack as an Event Publisher. Sequioa McDowell announced his Open Source LoopBack JSONSchemas VS Code Extension, a tool that pushes the documentation to you while you code. The result? You can avoid typos, find configuration errors early, and learn baout useful features. Raymond Camden explained how to integrate LoopBack with ElasticSearch as well as how to build a Vue.js application with LoopBack as the back end. David Okun told us how he used LoopBack to build the Open Source Game Xtra Points, how to use LoopBack with Facebook’s Graph API for user authentication, and how to generate a client SDK for LoopBack with the Bluemix cloud CLI. Sakib Hasan demonstrated how to Dockerize LoopBack Connectors for a simple way to set up and tear down a database service on request. Joe Sepi used LoopBack to build a band app in his multi-part series that began here. With Fall arriving, the focus on the new version of LoopBack began anew. LoopBack.next was now known as LoopBack 4, and on October 19th Diana Lau invited contributors on LoopBack extensions to help promote extensibility and grow the ecosystem. The first LoopBack 4 workshop was held at CASCON in November. Titled “API Economy Made Easy with LoopBack 4”, the tutorial is available on GitHub if you missed it. A brand new LoopBack core written in TypeScript with great extensibility and flexibility. An OpenAPI spec driven REST API creation experience. On November 30, Taranveer Virk discussed LoopBack 4 Extensions again, explaining how LoopBack 4 extensibility makes writing extensions simpler than ever and showing how by writing an example log extension. With LoopBack 4 imminent, we are considering a new look for LoopBack as well. We reached out to the community for input on options for a new LoopBack logo and color palette. The survey closed on December 18th and we will be provdiing updates in early 2018! Throughout 2017 our Evangelist team continued to share their knowledge of LoopBack. We sponsored 33 events (meet-ups, conferences, workshops, and hackathons), sharing LoopBack content at 28 of them. We appeared at 5 events we did not sponsor, and held 3 webinars. Throughout each of these events, we were and are amazed at the enthusiasm LoopBack users share, and the intriguing questions and scenarios they can come up with. It’s this enthusiasm that has also helped shaped LoopBack’s growth and future. With all of this activity, a GitHub achievement almost went by unnoticed! LoopBack hit 10k+ stars in November. We are humbled by the support of our community, and invite you to “star” strongloop/loopback-next as well! With LoopBack 4 just about ready for prime time, we are looking forward to seeing how the community uses it and helps it grow.